For the prevention of gas, bloating, and diarrhea associated with digesting dairy. How it works: This product contains a natural lactase enzyme that your body may not produce enough of. It works naturally and in harmony with your body to help you digest dairy. *This statement has not been evaluated by the Food and Drug Administration. This product is not intended to diagnose, treat, cure or prevent any disease. 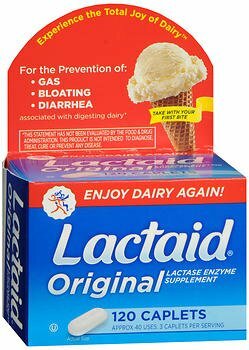 If you have any questions about this product by Lactaid, contact us by completing and submitting the form below. If you are looking for a specif part number, please include it with your message.